President Donald Trump said he's considering withdrawing U.S. forces; his advisers say ISIS hasn't been crushed. 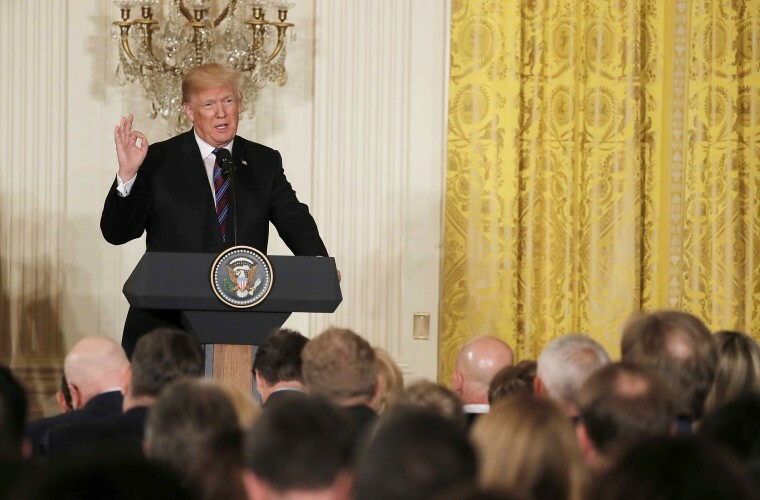 WASHINGTON — President Donald Trump said Tuesday that he wanted to get out of Syria and bring U.S. troops back home — only moments after his top advisers said publicly that the fight against ISIS was not finished. The president, speaking at a joint press conference at the White House with the leaders of the Baltic states, did not give a timeline for the U.S. departure but said a decision would be made soon. The U.S. has around 2,000 forces on the ground fighting the terrorist group. "We are in Syria to fight ISIS. That is our mission," McGurk said, standing alongside U.S. Army Gen. Joseph Votel, commander of the U.S. Central Command, at the U.S. Institute of Peace. "Our mission is not over. And we are going to complete that mission." Trump did not contradict the sentiment, telling reporters Tuesday, "We will not rest until ISIS is gone." But the mixed messages from the administration have made the timeline for any U.S. withdrawal unclear. U.S. and coalition partners on the ground have taken control of almost 95 percent of the territory in Syria once held by ISIS but U.S. officials have said their remaining presence will prove difficult to eliminate quickly and could take months. Trump said Tuesday that he believed the U.S. had almost completed the task and the military's success on the ground was close to 100 percent. For his part, Votel stressed the importance of stabilization in Syria, and said the U.S. military can help. U.S. officials have confirmed a Wall Street Journal report that a hold has been placed on $200 million pledged by the U.S. for those stabilization efforts in Syria. McGurk said Tuesday that the funds were under review but stressed that U.S. efforts to clear land mines, remove rubble and restore basic services such as electricity and running water would continue. "It is not hampering our work in the field," he said. "Our diplomats and our development experts from State and USAID have plenty of work to do, and they also have enough resources to continue with that work."